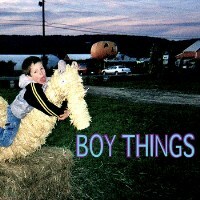 Boy Things is a five piece crew from Hackettstown, NJ. Their brand of music is overall indie, but there’s also a whole lot of interesting little bits added here and there that help keep everything intriguing. This self-titled EP is the first for the group. It was released on their BandCamp page in October 2011 and contains 6 tracks that are perfect for late night rock parties and dancing. and Robert Aldo Blake (synth); the band clearly has something up their sleeve that’s worthy of a listen. The first time you hear Buyer’s Remorse (the opening track from the EP) you’ll realize why it’s a bit tough to confine Boy Things into the strictly “indie” genre. Apart from all the components that make an “indie” sound, the track also comes with a nice punk aesthetic. Moreover, the alternating female and male vocals add a nice touch to the song. Dirty Dancing continues on the slightly punk trend but this also showcases a lot of the band’s hipster side. Beth’s vocals are rougher but still quite prominent which provides a nice balance to the catchy beat that’s hard to shake off. Most of the songs clock in around 2-3 minutes, with the shortest (Salutation) being nothing more than a 25-second blitz of shouting and mad party gang vocals. Open Mind, perfectly caps the EP; bringing home what the band is all about with upbeat guitars and distinctive vocals. Overall, the group has created a likable EP that can be played almost anytime, anywhere. I’m not going to deny that, yes, they do sound like most other indie rock bands trying to make their mark; but then again there’s no doubt their sound is catchy and definitely enjoyable. Check it out for yourself.